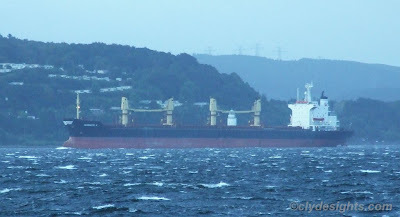 Despite the weather, the bulk carrier GEORGETE K. moved from Brodick Bay early this morning for her voyage to Shieldhall, where she will discharge her cargo of animal feed. GEORGETE K. was built in 1984 by Mitsubishi in Japan, and was originally named HIGH CHALLENGE. A charter to Star Shipping saw her being renamed STAR ORCHID in 1989, then STAR CASTOR in 1994. In 2000, she was given her present name. GEORGETE K. is 176.0 metres long, and has a deadweight of 34,607 tonnes.